Last week by poor coincidence, I was able to make a registration for the Fuji Speedway race on this Sunday. Alain asked me if I wanted to go and with my son being in Germany, my daughter on a figure skating trip to Nagano, I quickly calculated my chances: One nice Spanish dinner for my wife on Saturday evening, asking her over a glass of redwine, if it would be possible to get family free on Sunday? It was worth the risk. Registered, got a haircut, made a reservation at Cicada. I never had to got up so many times so early as this year. First I attended a lot of JCRC races in places far away from Tokyo (Gunma CSC) so I needed to get up early. Then, the German soccer team proceeded to the final of the European Championship. Unfortunately the games started at 3:45 in the morning so I need to drive my son to the German School to watch them until the bitter end. Alain picked me up at 5 AM on Sunday, as we need to register by 7:30 AM and the race started at 8 AM. He is a fast driver (just as me he oversped 52 km/hr when he was finally caught by the ever vigilant Japanese police) and as such he has now installed many technical gadgets in his car which should warn him of speed traps. That's why we were at the Fuji Speedway already at 6:30 hr and both of us wished we would have slept half an hour longer. It became clear that it will be a very hot day. But I didn't mind, we were registered for the 2 riders 210 minutes race, so we could take turns and I had my comfortable camping chair with me for the relaxing parts between the stretches. As Alain is the better rider, my secret strategy was to convince him to do much more laps than I would do, thus extending the relaxing part on the camping chair. Unfortunately then we found out some things which put both of us in a very bad mood: First, just by chance, when I checked the race results of last year in the booklet, I noticed that the winning team in the 2 riders category did 56 laps, in the 3 riders category 78 laps and in the four rider category more than 100 laps. This seemed strange, so I asked one of the officials and he told me that all riders need to be on the track all the time and that the combined lap numbers of all riders decides the wining team. Goodbye camping chair. Also it became hot. And I only brought a small water bottle the event. And when we checked the track we found out to our dismay, that it is very hilly. A long straight at the start is followed by a nice descent where one can reach easily 60 km/hr and more and over sprint the next hill, but then the climb starts in three stretches for a total of 40 meter elevation difference until one is at the final straight again. So what I thought would be a nice and relaxing race, turned out to become a long, hellish and warm nightmare without water and not too much chances to win anything. Anyway, we didn't complain further and Alain gave me some good training how to touch other riders while riding fast and get them out of the way. I immediately applied that at the start but as I am only a beginner at becoming rough around the edges, I could not follow Alain who ellbowed his way to the top. 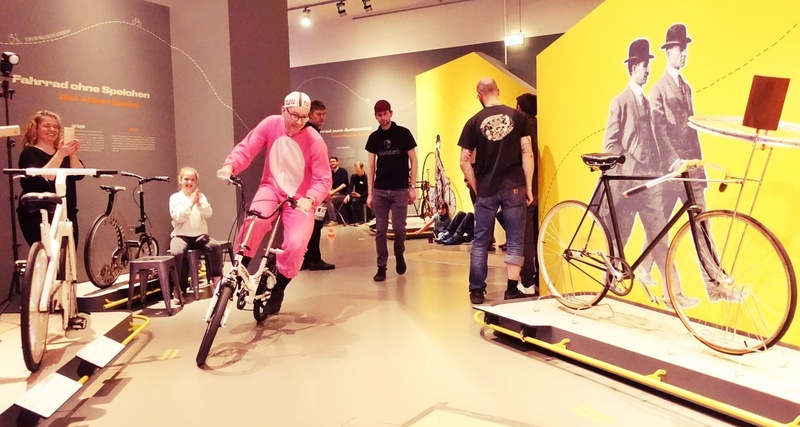 The race was started with a pace making bike and as there were about 500 riders on the track the first crashed already occured. I was OK so far, but then the climb began and I couldn't kept the fast space of the first group and fell back. A lot of faster rider overtook me then. But I settled for my own pace and after 4 laps I overtook other riders and rode a steady pace. I was missing the warm-up though. The fast group overtook me already after 45 minutes for the first time - they were really fast. Also Alain overtook me after one hour as he was still riding with a good and fast group. The climbs at 30 degrees plus were really the hard part. All in all I did more than 1.000 meter of climbing at this race. 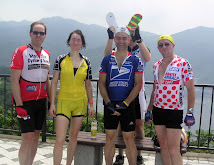 I really hated myself for being that fat; I must try harder to shed about 10 kg, as otherwise my climbing life is miserable. On the straights and on the descents I could easily go the same pace as the faster groups, even overtaking a lot of guys. But at the climbs I fall back and then I ended up again on the straights behind some slow guys creeping towards the finish line at 33 km/hr where I could go easily 40 km/hr without being drafted. That kept on and on for the first 2 hours or 16 laps. I had steady lap times of less or around 8 minutes (4.56 km track) and I calculated that I could make 26 laps within the 210 minutes limit if I could keep that speed. But after the two hours I got really tired. I was running out of water and I had two normal 0.5 liter PET bottles in addition with me which took hours to open and close. My left hand was completely numb and I couldn't unscrew the cap any longer - simply no power left in my hand, everything drained by the legs. I opened one gel to get some more energy, miscalculated my hand pressure, the gel was all over my hands and handle bar, everything got sticky .... And it was so hot. My feets were getting extremely hot in my SIDI shoes. Probably I would have made a break, retired or go slower if I would have been solo, but I knew that Alain was somewhere out there fighting so I kept going. 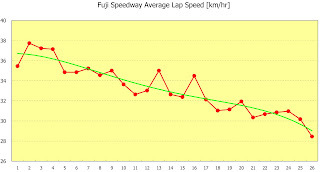 One can see my dropping performance where nice on the average lap speed chart here. After 2:30 hrs I really started to count the laps and the minutes. I didn't got overtaken by Alain again, which meant that he was experiencing the same problems as I did. I noticed than that my speed has dropped in such way, that I would do only 25 and not 26 laps anyway, so I took it a little bit slower. 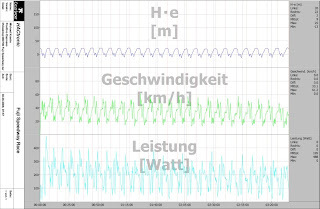 Actually my climbing became a little bit better compared to the other guys in the field: A saw a lot of riders standing on the trackside, massaging their legs or making a rest or really at the edge of their abilities and going up at 6 km/hr. I definitely didn't want to end up there, so I made some efforts at the climbs. The last climb before the straights comprises of three climbs, interrupted by two flat curves. The first one is hard, but the other two ones I cut on the inside where the distance is shorter but the inclination higher and I regularly overtook some of the better guys there. Hey, this is a genuine formula one track, why is it not flat ???? Formula one cars are fast enough, they do not need additional acceleration by going downhill! In the end I was not thinking any longer, riding more or less on automatic. I made my 25th lap before the time limit of 210 minutes, then started another one at an easier pace. I asked another rider on the track when the race is over and he said the last lap before 210 minutes counts. So I took it even easier. 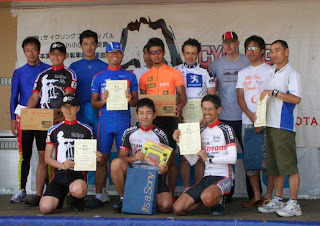 I could not judge from the other riders, as the 5 hour team race and some of the 150 km distanc race was still ongoing. So when arriving at the final straight before the finish line at my 26th lap, I opted for the pit lane, then I noticed that there was no time measurement there but didn't care as this lap was supposedly not to be counted. A mistake of course, I should have crossed the finish line one more time and then moved to the pit, so I missed one lap. When coming to the pit Alain was already there. He overlapped me only one time and moreover I was happy to note that also he gave everything as well so we could expect a good result. I would have been really angry if he decided to quit the race or took a longer break in my caming chair. Stephane and Kenichi from NFCC arrived as Kenichi was attending a BR-2 race in the afternoon. We were really tired, then packed our stuff. I also briefly spoke to David Marx who had an Assos tent at the pit and sold his stuff. He made a good business, in particular selling water bottles. Ok, then the results were posted, we made 4th place in our category, even if I would have done one more lap that wouldn't have made any difference. Excellent result, but really achieved by hard work and both of us fighting to the end. Then we were called on stage and got our commendation and the prices. Hm, a nice big bag with the words SONY printed in big letters ... A play station portable perhaps? Maybe not, the first places got only a box of sport drinks. So I opened the bag. Inside : 2 bottles of sport drinks. Unbelievable ketchi prices !!! I got two bottles for free even before the race when I asked for them. Bloody capitalist oppressors, the wrath of the working riders will hit you some day ! Anyway, Alain drove me home, we had a good time, we were satisfied with our result and very, very tired. I slept for some hours at home. Before I woke up, showered and went to bed. Really, I shouldn't do these things. Congratulations again Alain and Michael...what a fighting spirit !!! It must have been a terrible feeling seeing the liquids in the small drink bottle disappear. Hello, I am Yoshinori (long white sleeve I wore in the picture). Since Tom accessed to my blog, I have known the team NFCC. 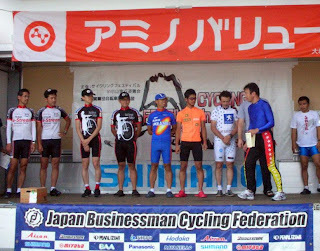 It was nice to ride bike in the same race even if it was too hot. Thanks for writing to Yoshinori-san, the great Belgium-phile. I've exchanged a few messages with him but we always seem to miss each other at the races. 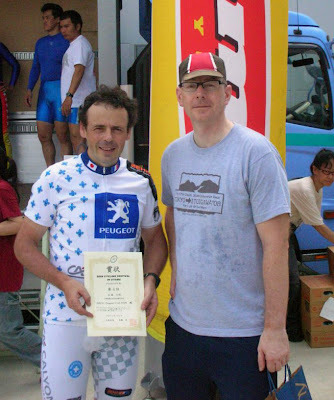 ...just for the avoidance of confusion, Michael and I are members of two teams; one is NFCC with BR-1, BR-2 and BR-3 riders in it, and the second one a much less "professional" team called Positivo Espresso, named after Nagai-san's famous shop in Todoroki (the Positivo Espresso jersey is even being sold there!) our unofficial sponsor. For next year, I am adding this Fuji Speedway to my list...feels like my cup of tea!